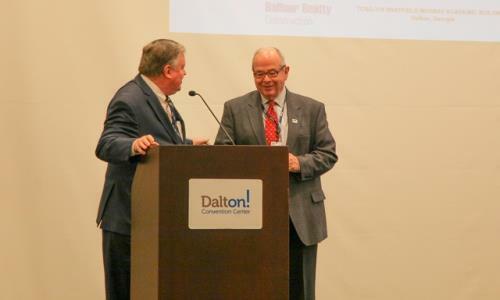 President and CEO of the Carpet and Rug Institute and Technical College System of Georgia Board Member Joe Yarbrough, left, speaks on behalf of Georgia Northwestern Technical College President Pete McDonald. Yarbrough spoke in regards to McDonald’s pending retirement and his lifetime of dedication to higher education in Northwest Georgia. 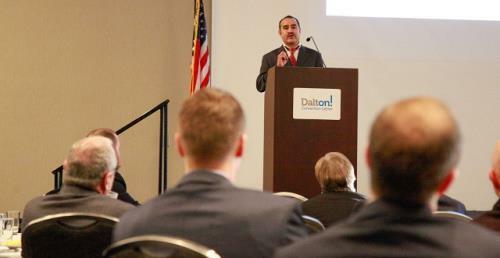 Business and political leaders from Dalton, as well as all across the Northwest Georgia region were on hand for the Greater Dalton Chamber of Commerce’s “Good Morning Dalton: Higher Education” event Tuesday morning at the Dalton Convention Center. 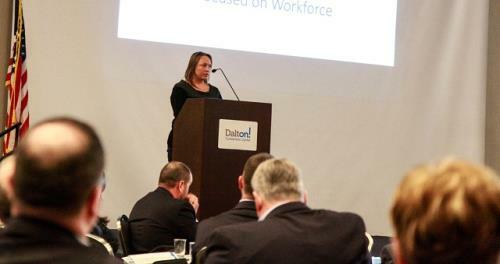 Students and administration from both Georgia Northwestern Technical College and Dalton State College shared their stories of success and growth with those in attendance. For GNTC, Social work assistant program student Pamela Tallent, business management alumnus Adrian Gutierrez and College President Pete McDonald took the stage. All three spoke on the impact the college has had, as well as the growth it has seen in just the past few years. Ms. Tallent, a current student, and Mr. Gutierrez, a graduate of GNTC, both commented on the efficiency and affordability of higher education at GNTC. After coming to the states, Mr. Gutierrez would eventually move on to learn to speak English, earn his GED, and then a college education from GNTC. Mr. Gutierrez is now taking classes at Dalton State College to further his education and career.